We wanted to know what the favorite restaurants for kids in Central Florida were. So, we asked! What is YOUR favorite restaurant for kids in Central Florida? 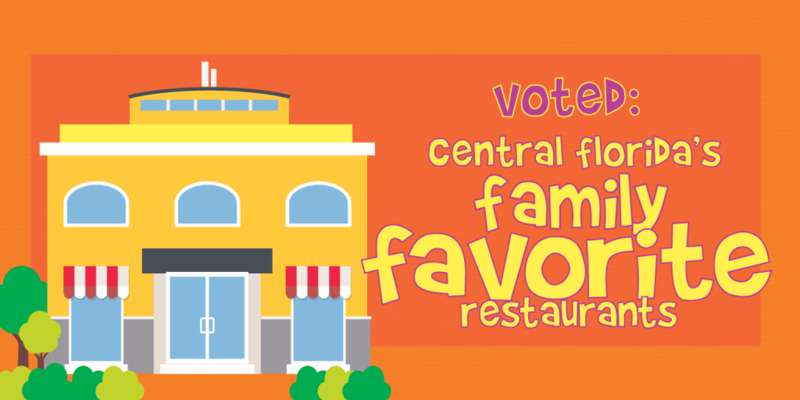 Below is a list of the restaurants that were voted at the top of the list for families in Central Florida. Have one that we missed? Send it to us at Brandi@MyCentralFloridaFamily.com. We’d love to know about it! Below, you can check out the Top 20 Favorite Restaurants for Kids in Central Florida. Hopefully, you can discover a new place to head out and eat with the kids! These are ranked, in order with the top vote-getters listed on top. Also, don’t forget to check out our Kids Eat Free Guide to Central Florida! We love a great deal and having your kiddos enjoy a free meal is always a plus! 1. Chick-fil-A: At Chick-fil-A, there are often lots of family programs and great indoor and outdoor play areas. Click here to check out our Chick-fil-A Guide to Events. 2. McDonald’s: A favorite for Happy Meals and for the indoor and outdoor play areas where the kids can burn off that extra energy! 3. Kobe Japanese Steakhouse: Having chefs prepare your food in front of you is an added bonus. Watching the volcano and fire makes it a kid favorite. Don’t forget their Kids Eat Free offer! 4. T-Rex: A fun themed restaurant in the heart of Disney Springs, kids can enjoy the dinosaur interaction while they dine. 5. Rainforest Cafe: Another fan favorite at Disney Springs! Enjoy the rainforest sights and sounds while you enjoy a wide menu variety. 6. Chuck E. Cheese: Say no more! Pizza AND games? The kids are in! 7. The Old Spanish Sugar Mill Grill & Griddle House: Make your own pankcakes at your table? Who’s not in for that? The Old Spanish Sugar Mill is a unique restaurant located inside De Leon Springs State Park. 8. Dave and Buster’s: Again, games and food in the same place? This is a kid favorite for all the fun involved with eating! Located on International Drive, there’s plenty of fun, food and yummy treats! 9. Cracker Barrel: Southern style cooking at it’s best. And, if the kids are lucky, they get a toy or candy on the way out in their cute shops! 10. Pirate’s Dinner Theater: A great themed restaurant on International Drive, for kids that love pirates, this is a can’t miss experience. Enjoy dinner and a show! 11. Steak n’ Shake: Milkshakes, burgers and fries? Yum! And, kids eat free on the weekends! 12. Tijuana Flats: My 14 year old is in love with Tijuana Flats! They have some kids eat free offers and some yummy Mexican food! 13. Crisper’s: Healthy? I was surprised to see this made the list, but we clearly have some healthy kids out there! Sandwiches and salads are a must at Crisper’s! 14. Gator’s Dockside -Wings, fries, burgers and more! Gator’s Dockside has a great kids eat free offer on Tuesdays and TV’s full of sports…what’s not to love? 15. Mellow Mushroom: A fun pizzeria for the family with a variety of yummy pizza pies! 16. Chili’s: Chips and Salsa? Always a kid favorite. Yummy desserts too? Absolutely! 17. Ale House – Good food. TV’s. Inside and outside dining. And, a great kids free eat offer on Tuesdays! 18. Papa Joe’s: Yummy Italian in on the menu at Papa Joe’s! 19. Red Robin: Burgers. Burgers. And, burgers. But, what’s more? Unlimited fries and onion rings. Not a surprise this made the list! 20. Keke’s Breakfast Cafe: A great breakfast location for families. Healthy and hearty. Just the way we like it! Bonus! Medieval Times: A great show with a dinner that’s consumed by only your fingers…as they did it Medieval style! Kids of all ages enjoy the experience of Medieval Times! Bonus! The Melting Pot: For older kiddos and special occasions, this is a unique experience where kids can dip and boil their way through four courses of deliciousness! I hope this helps you decide on your next dinner adventure. Our community knows what their kids enjoy for dinner! We hope their ideas help you discover something new and fun too! Disclaimer: Please check locations, times, and menus before heading out. Kids Eat Free offers are always subject to change, so please be sure to confirm all details before heading out.